BCECE 2019: From the year 2019, BCECE examination will not be conducted now on. Now, admissions will be done through JEE Main 2019 & NEET UG 2019 examinations. Registration forms will be made available on the online website in March 2019. 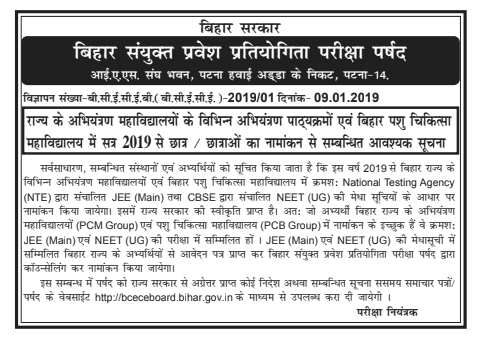 BCECE was a state level exam conducted by Bihar Combined Entrance Competitive Examination Board for admission of suitable candidates into various professional courses in various Engineering, Pharmacy and Agriculture colleges under the Government of Bihar. Here, candidates can gather details about BCECE 2019 application form, application fee, syllabus, Admit card, exam pattern, syllabus, result etc. Official admission schedule will be updated soon. Quick Update: This year, BCECE entrance exam will not be conducted for admission in engineering courses. Admission in engineering courses will be done through the JEE Mains 2019 scorecards. Check the official notification below. Candidates must be a permanent resident of Bihar and must possess domicile. There is no age limit for engineering and pharmacy candidates. Candidates must have completed the age of 17 years as on 31st December 2019 (only for agriculture course). For engineering and pharmacy candidates no age limit is there. Candidates must have passed 10+2 examination or equivalent with at least 45% (40% for SC/ST candidates) with Physics and Mathematics along with any of the optional subjects Chemistry, Biology, Biotechnology, and technical vocational subject from a recognized board. Candidates must have appeared in JEE Main 2019 exam. Candidates must have passed 10+2 examination or equivalent with at least 45% (40% for SC/ST candidates) with Physics and Mathematics along with any of the optional subjects Chemistry, Biology and technical vocational subject from a recognized board. Candidates can fill BCECE 2019 application forms through the online mode from the official website. Application forms will be made available tentatively from 1st week of March 2019. Candidates must submit the application forms within the specified dates. Candidates are advised to fill all the details correctly in the application. There is no need to send the printed copy of filled in application form to the Board’s office. Applicants should take a printout of the filled-in application form and confirmation form for future references. Applicants can make payment of application fee through credit card/debit card/ net banking and Bank Challan. BCECE 2019 will be conducted through online mode (OMR based). The total duration of stage-1 will be 135 minutes and stage-2 will be 90 minutes. Paper 1, Paper 2, Paper 3 and Paper 4 will be conducted in Offline mode (OMR based). The medium of the exam will be English and Hindi. 4 marks will be given for every correct answer. BCECE 2019 syllabus will include questions from subjects like Physics, Chemistry, Mathematics, Biology, and Agriculture. Physical world and measurement, Kinematics, Laws of Motion, Work, Energy and Power, Gravitation, Properties of Bulk Matter, Heat and Thermodynamics, Behaviour of Perfect Gas and Kinetic Theory, Oscillations and Waves, Electrostatics, Current Electricity, Magnetic effects of current & Magnetism, Electromagnetic Induction and Alternating currents, Electromagnetic Waves, Optics, Dual Nature of Matter and Radiation, Electronic Devices, Atoms and Nuclei and Communication Systems. Some basic concepts of Chemistry, Structure of Atom, Classification of Elements and Periodicity in Properties, Chemical Bonding and Molecular Structure, States of Matter : gases and liquids, Thermodynamics, Equilibrium, Redox Reactions, Group 1 and Group 2 elements, Preparation and properties of some important compounds, Some p-Block Elements, Organic Chemistry – Some Basic Principles and Techniques, Hydrocarbons, Environmental Chemistry, Electrochemistry, Chemical Kinetics, Surface Chemistry, General Principles and Processes of Isolation of Elements, p-Block Elements, d- and f- Block Elements, Alcohols, Phenols and Ethers, Polymers, Chemistry in Everyday life etc. Sets and functions, Principle of Mathematical Induction, Complex Numbers and Quadratic Equations, Linear Inequalities, Permutation & Combination, Binomial Theorem, Co-ordinate Geometry, Limits and Derivatives, Mathematical Reasoning, Statistics , Matrices, Determinants, Continuity and Differentiability , Applications of Derivatives, Integrals, Applications of the Integrals, Differential Equations, vectors, Linear Programming , Sequence & Series, and Probability. The diversity of living world, Structural organization in animals and plants, plant physiology, structure and function, human physiology, sexual reproduction, Genetics and Evolution, Biology and Human Welfare, Biotechnology and its applications, and ecology & environment. Introductory Agriculture and Agrometeorology, Soil as a medium of plant growth, Plant breeding and genetics, Agricultural Engineering, Crop protection, Animal Husbandry, Dairy and Fish Production, Cultivation of crops, Cropping system, Soil and water management, Weed management, Recent trends in agriculture, Agricultural economics Basic Horticulture, Fruit Production, Vegetable production, Flowers, medicinal and aromatic plants, Preservation of fruits and vegetables and Extension education. BCECE 2019 merit list will be released through online mode tentatively in the month of June 2019. Candidates can check the merit list on the official website.